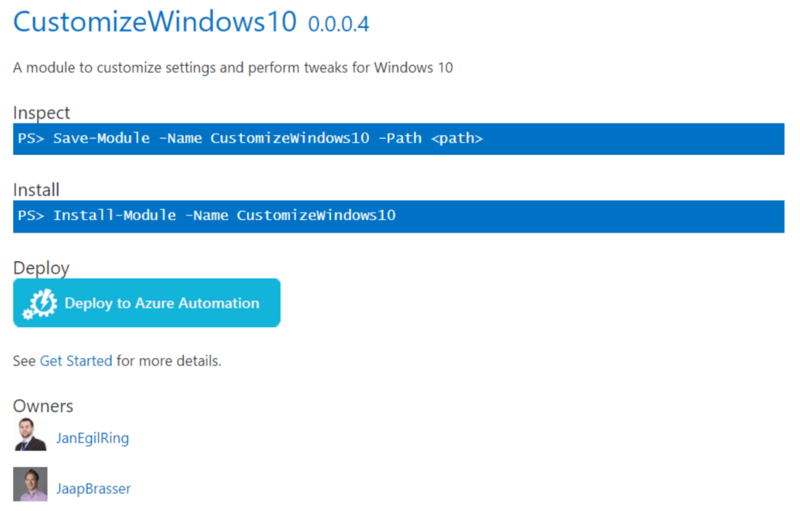 Today I finished another major update to the CustomizeWindows10 module I have been working on together with Jan Egil Ring. This module started as a means for me to configure/tweak Windows 10. When I was experimenting with the various Windows 10 insider builds I found myself configuring the same settings on each deployment and I was looking to simplify this process. The module contains a number of tweaks and configuration options to customize and personalize the Windows 10 experience. In the past I have uploaded the majority of my scripts and functions to the TechNet Script Gallery, but recently I have started using GitHub as a version control system for my scripts. Eventually I plan to upload my entire collection of scripts to GitHub as it provides the opportunity for easier interaction with a wider community but for now this module is my first experiment with both the PowerShell Gallery as well as GitHub. For more information or the direct download links of these scripts please refer to the links below. Feel free to leave a comment either here or to contribute directly on GitHub. This entry was posted in Microsoft, PowerShell, Windows 10 and tagged Customize, Desired State Configuration, DSC, GitHub, Jan Egil Ring, PowerShell Module, PowerShellGallery.com, Registry, Tweaks, Windows 10 on 2015-09-30 by Jaap Brasser. As I posted earlier in the Clear-RecycleBin New PowerShell 5.0 cmdlet, available in Windows 10 article, in Windows 10 it is now possible to clear the Recycle Bin. Because the functionality to actually view which files is not implemented in any cmdlet at the moment I decided to upload a new function, Get-RecycleBin, to the TechNet Script Gallery. Using the this function it is possible to view the contents of the recycle bin, including the filename, size and the current path in the Recycle Bin folder. This entry was posted in Microsoft, PowerShell and tagged Clear-RecycleBin, Get-RecycleBin, Shell.Application on 2015-09-24 by Jaap Brasser. After attending the PowerShell Conference Asia this weekend in Singapore I realized I did not update my scripts in the TechNet Script Gallery for a while, so I took some time to go through the feedback and feature requests for my scripts. I found out that there was some work to be done on a number of my scripts and I got started with it. First of all I started with the The Get-ScheduledTask script, I added in the ComputerName from which the tasks are gathered in the output. This was done to ensure that the script functions as expected when used in combination with the Remove-ScheduledTask script. Additionally I also included the triggers in the output as requested by Profile787. The Get-UnchangedPwdlastset script has also been updated, as one of the default values was being added instead of subtracted from the result as noted by Richard Mueller.Finally the last script that has been updated is the Get-LoggedOnUser script. Apaladi correctly noted that with certain regional datetime settings it would be possible for the script to truncate the data incorrectly. This entry was posted in Microsoft, PowerShell and tagged DirectoryServices.DirectorySearcher, Get-LoggedOnUser, Get-OrphanHomeFolder, Get-ScheduledTask, Get-UnchangedPwdlastset, HomeDirectory, PSConfAsia, quser, Remove-ScheduledTask, Schedule.Service, Scheduled Task on 2015-09-23 by Jaap Brasser.